Precision Locksmiths Sheffield are an independent family run, Sheffield based locksmith company, serving Sheffield, Barnsley, Rotherham, Chesterfield, Dronfield, Worksop and the Hope Valley. Precision Locksmiths Sheffield offer a rapid, 24 hour Emergency Locksmith Response, to help you with anything from simple lock fitting and lock security upgrades, lock repairs, emergency door openings, or securing premises, all at our lowest price guaranteed including special offers for home movers! Lost keys? Locked out of your home, business or vehicle? At Precision Locksmiths Sheffield we understand how easy it can be to mis place or snap a key and we offer a rapid response for any unforseen mishaps with keys. Had a break in? 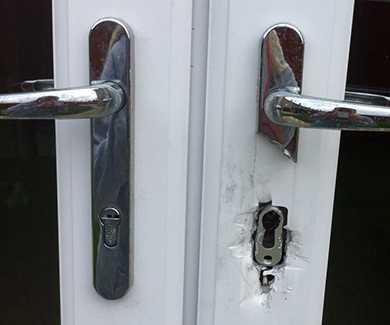 Precision Locksmiths Sheffield can secure your property and provide new locks and handles to repair your damaged door. Precision Locksmiths Sheffield also offer free home security surveys to assess your current home security and can advise on the best ways to make improvements and help prevent burglaries. Just moved to a new property in Sheffield or one of our other covered areas? It is always best to replace locks when moving to a new property, who knows how many sets are out there and who has them. Whatever your requirement for a locksmith, Precision Locksmiths Sheffield are here to help. Our lock entry methods are non-destructive and we are equipped with all the latest equipment ensuring a fast and reliable service throughout Sheffield and the surrounding areas. 25% of all burglaries are from lock snapping and as locksmith in Sheffield the effectiveness of this method of entry is unfortunately encountered every day. The method of lock snapping involves breaking the cylinder to then manipulate the lock to open. 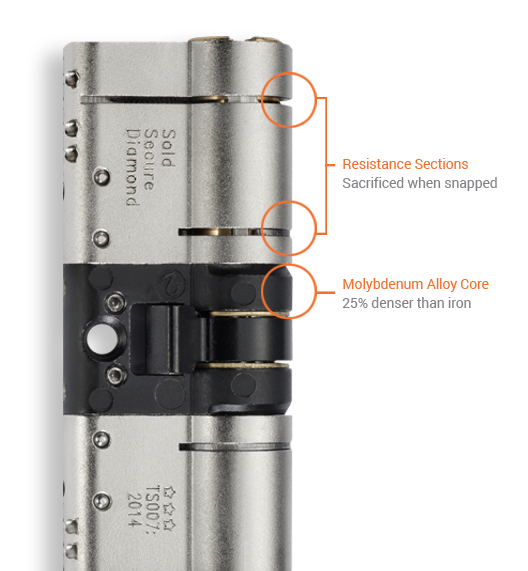 Whilst you may think that all the multi locking points on your door make it secure, it’s important to realise they are all operated by the cylinder – this is the weakest point and if compromised all the locking points are rendered useless. Lock snapping has become a real threat but can be avoided by installing the appropriate anti snap locks. The highest level of security standard that other 3-star anti-snap locks want but don’t get. This is the rigours of the TS007 3-star but with added aggression, and tested by an MLA locksmith. 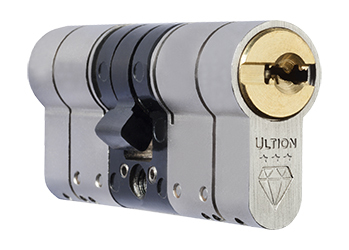 The tester is allowed more access around the lock, more tools, freedom to break the material surrounding the lock and the ability to pause the clock to consider a different tack – Ultion will also be tested to this standard. The Ultion lock has been tested to the needs of the British Standard TS007 3 star standard, without having to be paired upwith an expensive high security handle. 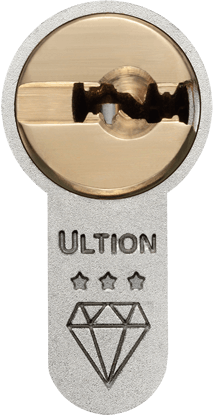 When Ultion is locked it is the actual center cam that gets independently secured, not secured to the internal plug – this means that even when the key is left on the inside of the lock, Ultion is still secure. Anti drill pins have featured in existing high end locks for a while. Ultion however has 6, in both sides of the body (because it is non-handed!). So the burglar meets the first two in the sacrificial section of the cylinder. But if he decides to snap the lock first then go for the drill he’ll find his drill bit fighting against 4 more anti-drill pins. In the plug itself is a further 8 (each side of course) and two anti drill plates. Normal, handed anti-snap locks feature a single sacrificial section and focus on strength to make snapping harder. Except the strength is never enough to withstand the force leveraged from a burglar’s mole grips. On each end of an Ultion cylinder there are two sacrificial elements, each designed to snap with relative ease, but more importantly in exactly the right place. When snapped the central cam is directly and independently locked – not to an attackable internal plug. 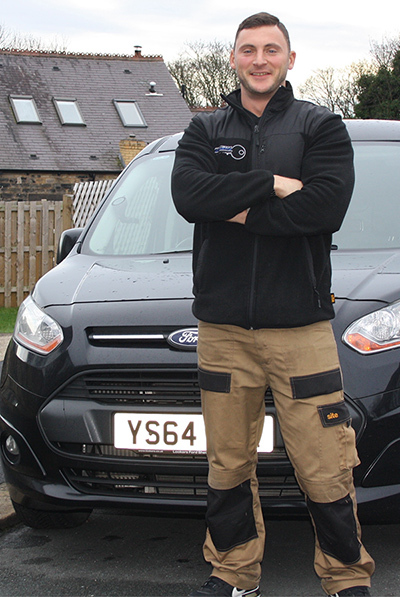 Call Tom, your Sheffield locksmith now on: 0757 713 8335. Precision Locksmiths of Sheffield offer a fully mobile auto locksmiths service, so appointments can be made at the location most convenient to you. If your vehicle locking system is failing to operate, or you’re unable to gain vehicle entry, then call us on 0757 713 8335. We’ll aim to get your vehicle unlocked and get you back on the road and on your travels, or support you in finding the correct solution quickly.